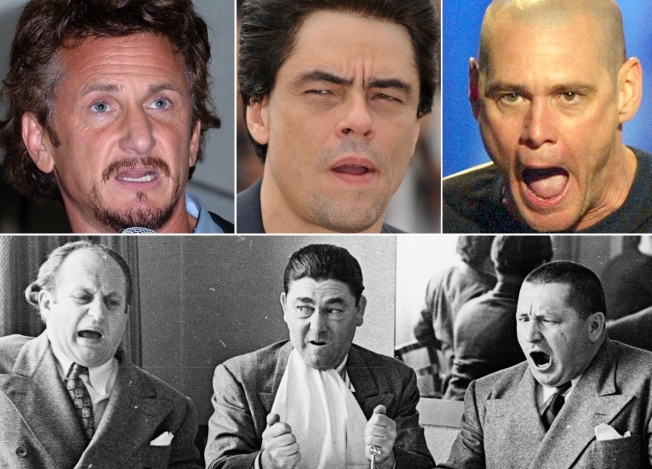 Sean Penn, Benicio del Toro and Jim Carrey are the newest "Three Stooges." "The Three Stooges" are about to enter the 21st century - and get a whole lot cooler. Superstar actors Sean Penn, Benicio del Toro and Jim Carrey are set to star in MGM's new take on the gut-busting slapstick trio, Variety reported. The studio has slated the Oscar-winning Penn to play Larry and Carrey to suit up as Curly, a role he'll reportedly gain 40 pounds of chunk to portray. Del Toro, who recently starred in biopic "Che," is in talks to star as the bumbling Moe. Comic geniuses Peter and Bobby Farrelly will direct the remake, to be released sometime in 2010. The Farrelly Brothers are best known for gems like "There's Something About Mary" and "Dumb and Dumber," which also starred Carrey. The remake has been stalled for several years as it flip-flopped between studios. It finally landed at MGM this season and will begin production within the year. Moe Howard, Jerome "Curly" Howard and Larry Fine played the goofy trio in the original Columbia Pictures shorts, which aired throughout the 1930s and 1940s.